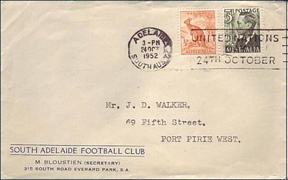 Cover – The Australian Philatelic Society Inc. In Philately, a Cover is an Envelope or package, typically with stamps that have been cancelled. The term originates from the practice of covering a letter by folding a separate sheet about it to physically protect and prevent infringement of confidentiality. In the first half of the 19th century it became the fashion to cut the cover into a diamond or lozenge shape. This was the precursor version of the Envelope as it is known today. Its popularity was ensured in Britain when the lozenge design was adopted for the special pre-paid postage Envelopes and covers issued at the launch the postal reforms of 1840.